‘If Freud had been asked to name his secret(ive) book,’ wrote Hélène Cixous, ‘he would not have hesitated: it would have beenThe Jungle Book.’ These words are re-written, crowded by many others from Cixous’s 2009 essay ‘Philippines’, on a tree made from papier-mâché in the exhibition space of a former sports centre in the Parisian suburb of Saint-Ouen. There are nine such trees in the room, made of diverse materials, the work of diverse hands, making the space itself into a kind of jungle. Amongst essays by Thomas Babington Macauley and the Austrian classicist Theodor Gomperz, Freud selected Rudyard Kipling’s book of stories, The Jungle Book (1894), in a list of ten recommended books upon the request of the publisher Hugo Heller in 1906. It was a book he described as ‘a good friend’. Its theme of the feral child is clearly very close to Freud’s concerns in those texts exploring the cases of the ‘Rat Man’ and the ‘Wolf Man’, which have become so central, particularly to recent (post-Deleuzian) Freud reception. According to Cixous, we all have such treasured books, which need not be great works of literature but remain very personal to us throughout our lives. They form the kernel of all our subsequent reading. For Cixous herself, that book is George du Maurier’sPeter Ibbetson (1891). But Cixous’s own ‘Philippines’ is the kernel from which Alexandra Grant’s present exhibition, called ‘Forêt Inérieure / Interior Forest’, has sprouted. Having grown from a text concerned deeply with dreams, memories and the unconscious, it is perhaps appropriate that all the trees in Grant’s ‘forest’ seem to have developed not from the ground up, but from the ceiling. Upon entering the exhibition space there is something almost repulsive about the works therein. There is a sort of unkempt ugliness to it – a frightening profusion of thoughts and ideas. The show repels in the way a dark forest might repel those who have always lived in the clearing. But there is little darkness here. The walls are covered in a kaleidoscopic stream of thoughts-as-images, drawn, painted and collaged from photographs, cigarette packets and wallpaper, in every imaginable colour from great wads of day-glo pink to carefully crosshatched greyscale. Within this splurge certain images recur: keys, crowns, ghosts, trees, animals, landscapes; sometimes very detailed, otherwise hastily scrawled and then scribbled out or drawn over. Amongst the images, there are words, mostly plucked from Cixous’s text, written in many different hands and several different languages. And there are references to numerous other art works, from the comic phantasmagoric style of Raymond Pettibon, to the brightly coloured geometries of mid-20th-century formalism, and, most explicitly, to Courbet’s L’Origine du Monde (1866), here rendered in the manner of a newspaper cartoon complete with shocked Victorian onlookers. Exploring this seemingly endless chain of references, I found myself increasingly drawn into the work. It became something very personal, very intimate, full of small revelations and private jokes. In all its disorder, it became an experience of exploring the ‘secret book’ of someone else’s unconscious. But it is an unconscious collectively written, the result in part of several open public drawing sessions held throughout the lifespan of the exhibition, and the intervention of a number of other invited artists, including Constance Ouvrieu, Tina Linville and Annelie McKenzie. This kind of ‘radical collaboration’ has been an aspect of Grant’s work since her first solo show in 2007 (as, indeed, have the ideas of Cixous). It gives her exhibitions something of the quality of telepathy as discussed by Cixous in Philippines, or of philosophy itself as a series of letters between friends, as discussed by Jacques Derrida. It is to Ronell’s work that my thoughts turned upon seeing the wax-crayon image of a console, labelled ‘Hub 40000’, on one wall of the exhibition. This white box extrudes a tangle of black wires leading variously to a human finger, an eye, a telephone receiver, a pair of ears, a set of Nintendo control pads and a brain whose spinal column sprouts leaves. From the phone’s earpiece spreads a muddle of words: ‘Hello it’s me / Allo! C’est Moi! / Ta voix entre’. It is with this ‘voice between’ that Grant’s work calls to us; between words and images, art and philosophy, dreams and reality, between, finally, two close friends. Hélène Cixous, December 2012. Photo: Kevin Kane. Hélène Cixous’s “Notre Spectacle” (Our Performance) is a short text originally written for the program of Le Dernier Caravansérail (Odyssées) (The Last Caravan Stop [Odysseys]), a play written collectively by the French philosopher Cixous and the Théâtre du Soleil in Paris in 2003. Cixous is a long-term collaborator of the Théâtre du Soleil and its director, Ariane Mnouchkine. Since the early 1980s, she has written works for and with them, including L’Histoire terrible mais inachevée de Norodom Sihanouk, roi du Cambodge (The Terrible But Unfinished Story of Norodom Sihanouk, King of Cambodia) in 1985 and Tambours sur la digue (Drums on the Dam) in 1999. In these plays, as in Le Dernier Caravansérail, Cixous and the Théâtre du Soleil are committed to political story-telling through episodic, large-scale spectacles with large casts that place the audience member squarely in the middle of the day-to-day experiences of those under the stresses of colonialism, persecution, and/or statelessness. What is impressive about the Théâtre du Soleil is their ability to entertain and marvel their audience while maintaining an empathic, non-exploitative, and non-didactic relation to the subjects of their work. No easy balance. As a collective, the Théâtre du Soleil has never produced a manifesto. But its egalitarian principles and its radical commitment to collaboration radiate through Cixous’s text. Structured as a series of questions, “Notre Spectacle” demands both ethical reflection and action from artists collaborating with someone other than themselves: across the boundaries of difference, language, and power. 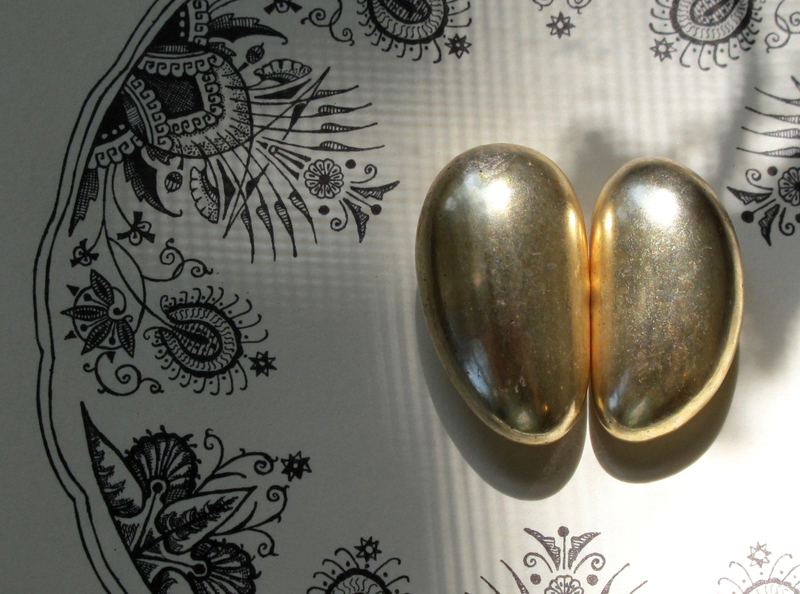 Questions of ethics in practice continue to be vital to artists, as many of us are working in collaborative or collective ways, either openly in the sphere of participatory artwork or “social practice” or privately in the space of our own studios with large-scale production teams whose identities are not disclosed in benefit of a central author. Collaboration itself is not a new phenomenon, but the terms under which collaborative work is accomplished are reframed by every generation in philosophical, legal, and financial terms. What is unusual and relevant about Cixous is that she is the rare theorist who also practices successfully as an artist and these practices are marked both by her ethics and her action-oriented stance. Théâtre du Soleil, Le Dernier Caravansérail (Odyssées): Origines et destins, “Sur la route de l’Australie,” Duccio Bellugi, Sébastien Brottet-Michel, Sava Lolov, Delphine Cottu, Serge Nicolaï, Vincent Mangado, and Dominique Jambert, 2003. © Michèle Laurent. Le Dernier Caravansérail gathers the stories of escape and unimaginable danger faced by migrants from the world over—Iran, Iraq, Afghanistan, Russia, Serbia—in search of better lives elsewhere. These “elsewheres,” such as Australia, France, and Great Britain, often materialize as places of great misfortune, as those seeking a better life often end up in political no-man’s lands, such as refugee camps and prisons. The stories presented in Le Dernier Caravansérail are based on interviews conducted by Cixous and other members of the Théâtre du Soleil with refugees across the world. Some are the stories of those living at the theater itself, which serves as a safe-haven and a place of employment and community. Le Dernier Caravansérail was originally presented as a two-part, six-hour play, with a break halfway through for a meal cooked and served by the actors—including some of the very same migrants whose stories the audience was watching. With forty-two scenes and at least twenty-seven actors, the play drew the audience into experiences that they may have only encountered on the news. In “Notre Spectacle,” Cixous asks, “How can you get as close as possible to the other without taking their place?” This is not a rhetorical question but one that interrogates the role and responsibilities of a writer representing the stories of powerless and displaced people. For this reason, her phrase “Comment ne pas,” which begins the first three lines, resists easy translation. The phrase can be translated in a multiplicity of ways: How is it possible not to…? How can we not…? How can you not…? How not to…? How to not…? Théâtre du Soleil, Le Dernier Caravansérail (Odyssées): Origines et destins, “Dernier assaut (Les voies),” Delphine Cottu and Sarkaw Gorany, 2003. © Michèle Laurent. Comment ne pas remplacer la parole de ta bouche par ma parole même de bonne volonté? Comment ne pas remplacer ta langue étrangère par notre langue française? Comment garder ta langue étrangère sans manquer de politesse et d’hospitalité à l’égard du public, notre hôte dans le théâtre? Comment, sans se comprendre en mots, se comprendre quand même en cœur? Comment ne pas s’approprier l’angoisse des autres en faisant du théâtre? Comment ne pas pécher par illusion de compréhension et par crainte d’incompréhension? Comment se mettre aussi près que possible de la place de l’autre sans la prendre? Comment ne pas traduire? C’est-à-dire: comment ne pas traduire? Il faut bien traduire. Comment ne pas se laisser séduire par la meute des bons sentiments? Comment ne pas en rajouter? Ni d’un côté ni de l’autre. Comment se glisser entre la bonne conscience et la mauvaise conscience, les siamoises? Comment tout dire sans un mot? Comment devenir humain c’est-à-dire jamais assez ni trop? Comment ne jamais renoncer à l’absolu que l’on n’atteindra jamais? Comment être l’acteur d’un personnage et non son maître? Comment se laisser être un refuge pour l’étranger? Comment ne jouer aucun rôle? Et si on n’y arrive pas? C’est la question du réfugié en son voyage. How not to replace the words from your lips by my words spoken in good will? How not to replace your foreign language by our French language? How do we keep your foreign language foreign without neglecting the politeness and hospitality due our audience, our host in the theater? How, without understanding each other in words, do we still understand each others’ hearts? How not to appropriate the anguish of others in order to create theater? How not to sin by illusion of understanding or fear of misunderstanding? How can you place your self as close as possible to the other without taking their space? How not to translate? That is to say: how to avoid translating? We must translate. How not to be seduced by good intentions? How to not lay it on thick? Not on one side or the other. How to slip between good conscience and guilty conscience, those Siamese twins? How to say everything without uttering a single word? How to become human, that is, never enough or not too much? How not to give up on reaching for the ideal that we may never attain? How to be the actor of a person and not her master? How to be a refuge for a stranger? How not to play a role? And what if we never arrive? That is the question of the refugee on her journey. Hélène Cixous is an Algerian-born French writer whose work spans many disciplines from poetry to playwriting, literary criticism to philosophy. Charged with founding Paris VIII University in 1968 (with a faculty that included her peers Michel Foucault, Felix Guattari, and Gilles Deleuze), she also established the first women’s studies program in Europe. She is the author of more than 40 books, over 100 essays and 15 plays, and, in the United States, is perhaps best known for works that analyze and take issue with traditional Western notions of femininity and gender. Alexandra Grant is a text-based artist who uses language and networks of words as the basis for her work in painting, drawing, and sculpture. She has explored ideas of translation, identity, and dis/location not only in drawings, painting, and sculpture, but also in conversation with other artists and writers, such as her long-term collaborator, hypertext author Michael Joyce, and the philosopher Hélène Cixous. Her recent project with Cixous, Forêt Intérieure/Interior Forest, was a participatory exhibition at 18th Street Arts Center, in Santa Monica, California, and Mains d’Oeuvres, in Saint Ouen, France, in response to Cixous’s book Philippines. Please join the Cixous Reading Group for a wonderful event at The Actors’ Gang Theatre on Sunday, October 13th. 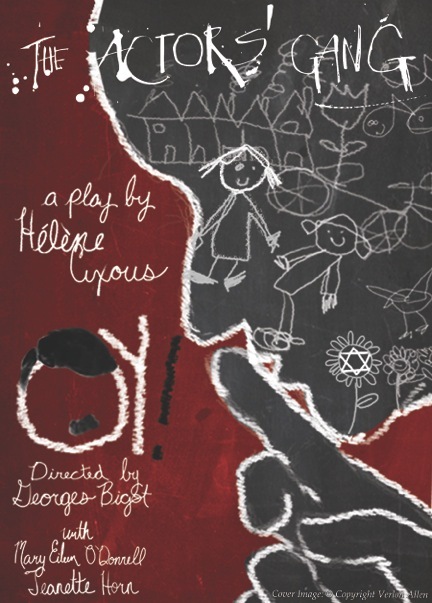 Following the performance of Oy!, Hélène Cixous’s play about her mother and aunt’s return to Germany for the first time since World War II, we will hold a special reading group session with the play’s two actors, Mary Eileen O’Donnell and Jeanette Horn. Many of you will remember them from the reading of Philippines that took place at 18th Street Arts Center, and from the performance they did for the KCET documentary on the Interior Forest. When: Sunday, October 13th at 2pm for Oy! To RSVP and reserve your ticket, please send a note to interiorforest@alexandragrant.com. Tickets for Oy! will be $20 each. If you would like a hard copy of the play, please email interiorforest@alexandragrant.com. Cindy Rehm va habiter l’espace en utilisant les livres secrets de Hélène Cixous et Alexandra Grant, à l’image d’un rituel privé qui explore le transfert entre l’intérieur et l’extérieur du corps par des méditations silencieuses et des gestes symboliques. Secret Book reflète les thèmes récurrents du livre “Philippines” d’Hélène Cixous, y compris la télépathie, le double, la relation entre le rêve et la vie et l’imagination sans limites de l’enfance. Secret Book, a new performance by Cindy Rehm, reflects reoccurring themes drawn from Hélène Cixous’ Philippines, including telepathy, doubling, and the relationship between dream-life and the limitless imagination of childhood. Within the performance, books appear as magical objects that serve as pathways for telepathic communication between the author and reader. Rehm will transverse the space using the professed secret books of Hélène Cixous and Alexandra Grant, as she enacts a private ritual that explores transference between the interior and exterior body through quiet meditations and symbolic gestures. Cindy Rehm was a collaborator in the 18th Street Arts Center iteration of Alexandra Grant’s Forêt Intérieure/Interior Forest, through both drawing and active participation in the Cixous Reading Group. Founded in January of 2013, the on-going bi-weekly reading group has read works by Hélène Cixous including a deep exploration of Philippines. 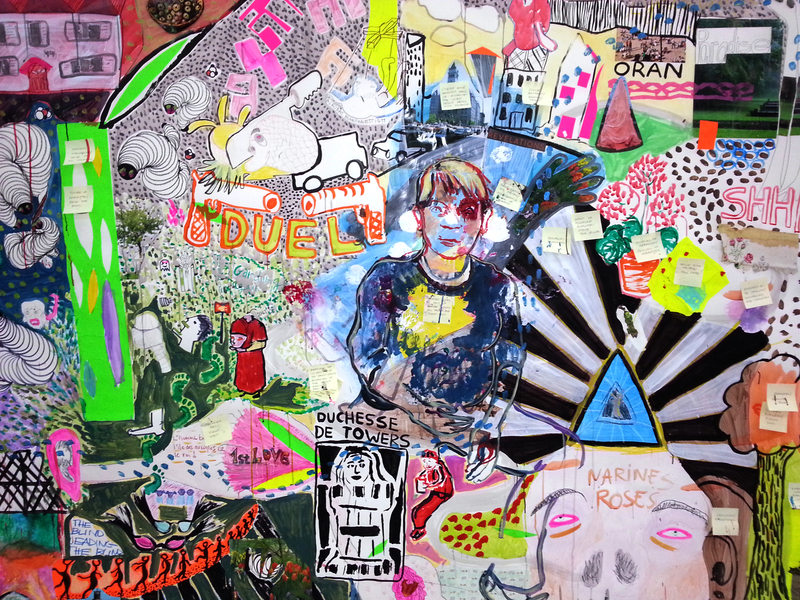 Rehm is a Los Angeles based artist and educator. She is co-founder and director of the feminist centered project Craftswoman House. She is the founder and former director of spare room, a DIY installation space in Baltimore, MD. From 2001-2004, she served on the Editorial Board of Link: A Critical Journal on the Arts. Rehm is the recipient of an Individual Artist Fellowship in Media from the Tennessee State Arts Commission and a Learning to Love You More Grant. Her work has been shown at national and international venues including, the Torrance Art Museum; Torrance, Woman Made Gallery; Chicago, Consolidated Works; Seattle, Goliath Visual Space; Brooklyn, Transformer Gallery; Washington DC, LACE; Los Angeles, and the Archeological Museum; Varna, Bulgaria. Forêt intérieure/Interior Forest est un projet multifacettes créé par l’artiste angeline Alexandra Grant. 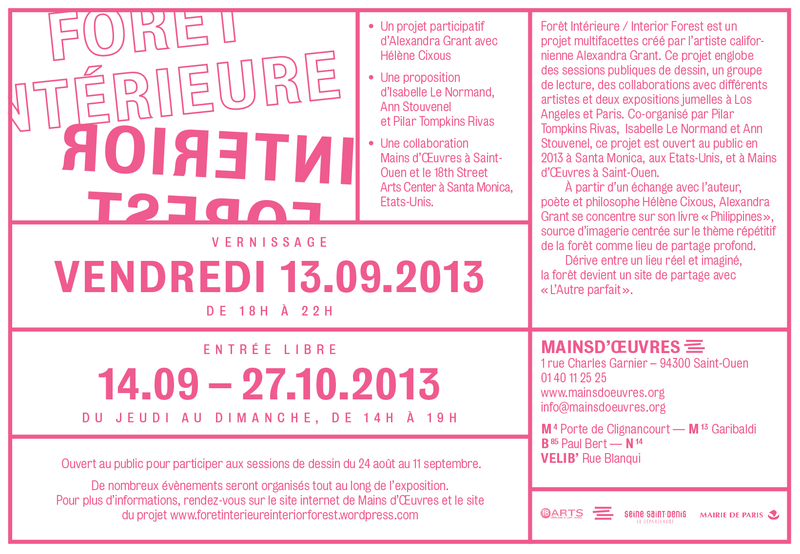 Ce projet englobe des sessions publiques de dessin, un groupe de lecture, des collaborations avec différents artistes et deux expositions jumelles à Los Angeles et Paris. A partir d’un échange avec l’auteur, poète, et philosophe Hélène Cixous, Alexandra Grant se concentre sur son livre Philippines, source d’imagerie centrée sur le thème répétitif de la forêt comme lieu de partage profond. Dérive entre un lieu réel et imaginé, la forêt devient un site de partage avec “L’Autre parfait”. Dans Philippines, Hélène Cixous explore les constructions philosophiques et sociologiques de “L’Autre” à partir des textes de Sigmund Freud sur les rêves partagés, de Jacques Derrida sur la télépathie, et du roman de Georges du Maurier Peter Ibbetson, où deux amis d’enfance, séparés par leur classe sociale et leur pays, se rejoignent adultes dans leur vie rêvée. Avec Forêt intérieure/Interior Forest, Alexandra Grant examine les idées “jumelles” de Philippines, comme rêve et réalité, télépathie et empathie, et la relation hommes et femmes, adulte et enfant, colon et colonisé. Le projet prend vie à travers une illustration du texte, une installation de forêt comme image et mise en scène, et des collaborations avec d’autres artistes et le public. Forêt intérieure/Interior Forest permet à la pratique d’atelier d’Alexandra Grant de s’étendre à l’arène de l’engagement public. Du 24 août au 12 septembre prochain, elle a organiser des sessions de dessin, invitant le public à participer à la construction de ce projet à grande échelle, avec Fabien Vehlmann, Daniel Oglander, Meital Yaniv, Florian Viel, Laura Pardini, Guillaume Legrand, Laetitia Favret, Christiane Georgi, Nathalie Harvey, Maelle Schneider, Antoine Lombart, Antoine Aubert, Valentin Lerges, Stefan Delvoye, Kate McCrickard, et Zoe Crosher. Afin d’explorer l’espace entre une esthétique spécifique et un processus de partage, Alexandra Grant a demandé a Constance Ouvrieu, Tina Linville and Annelie McKenzie de produire les sculptures “Arbres d’ailleurs” pour son installation. 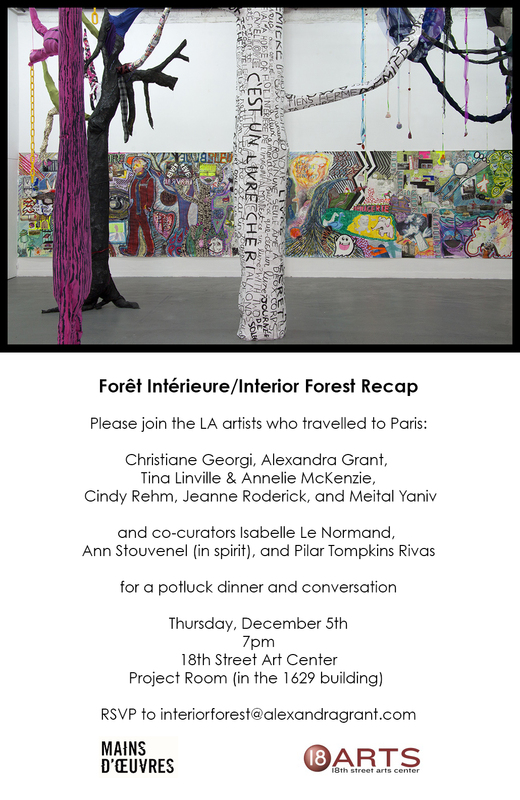 Forêt Intérieure/Interior Forest is a multi-faceted project by Los Angeles-based artist Alexandra Grant encompassing a series of public drawing sessions, artist collaborations and an installation at Mains d’Oeuvres. The exhibition is the twin of the Interior Forest project, which took place at 18th Street Arts Center from April – June, 2013. In Philippines, Cixous explores the philosophical and sociological constructs of the “Other,” linking texts from Sigmund Freud on the shared dream, Jacques Derrida on telepathy, and the story of Peter Ibbetson, a novel by Georges du Maurier, where two childhood friends separated by class and country are reunited as adults in their joined dream-life. Within Forêt Intérieure/Interior Forest, Grant examines the “twinned” ideas of Philippines, such as dreaming and reality, telepathy and empathy, and relationships between man and woman, adult and child, and colony and colonizer, through illustration of the text, an installation of the forest as image and stage-set, and through collaborations with other artists and the public. Structured as a residency and an exhibition, Forêt Intérieure/Interior Forest extends Grant’s studio practice into the arena of public engagement. Grant has held collaborative drawing sessions ongoing since August 24th that invited community participation to construct a large-scale, site-specific work. Hosts for the drawing sessions included Fabien Vehlmann, Daniel Oglander, Meital Yaniv, Florian Viel, Laura Pardini, Guillaume Legrand, Laetitia Favret, Christiane Georgi, Nathalie Harvey, Maelle Schneider, Antoine Lombart, Antoine Aubert, Valentin Lerges, Stefan Delvoye, Kate McCrickard, and Zoe Crosher. Exploring the space between a specified aesthetic and shared process, Grant engaged artists Constance Ouvrieu, Tina Linville and Annelie McKenzie to make “Visiting Trees” (Arbres d’Ailleurs) for the installation.